Enjoying an after run treat, with one of my favorite running partners, my son! I am thankful I can run with my children and model healthy living for them! My weight loss journey is good for my whole family. Today I went running for the first time in almost a month. It was a slowly, short and easy kind of run with one of my favorite running partners, my son. As we ran along a new path in our new hometown, I felt calm and at peace. I haven’t felt this way in a long time. *Unpacking one day was empowering. The next day it was overwhelming. *Taking a walk was the start of a new exercise routine. It was not. *Cooking from scratch one night was great. It was not a regular activity. *One writing session was the path back to my blog and novel. That path was ignored until today. *Now that the scale is unpacked, I’ll start using it. It’s still gathering dust in my new bathroom. If this happened instead of my actual goals, why does one day of running make me believe that I find my way back to my healthy lifestyle? Because I finally acknowledged that I need to really want to change. I accept the fact that I need to take baby steps to get back to the place I am healthiest and happiest. In the first year of my gastric sleeve surgery, the weight flew off. It took a lot of mental work, but physically I had the help of my small stomach. I was making leaps with my weight loss. In the following years I was still making large strides with the addition of regular exercise. I crave the accolades of running my first half marathon and successfully learning strength training skills. Tangible results are addicting and I think I’m feeling the crash of not having regular successes that are measured by pounds, inches, and race results. If I really committed I could be back there. If I tracked my food or did an elimination diet again, the pounds would drop off. If I signed up for another half marathon or finally set up a home gym like I promise to do every year I’d be back in better shape. Oh, I know I can do all this. I’ve set big goals and succeeded. What’s holding me back? The thought of food journaling, following an elimination diet, and a strict exercise routine overwhelms me. Perhaps it’s because I have so many other responsibilities that I feel like adding a rigid regimen to my life is too much to handle. Of course part of me thinks I should just wait for three weeks until my kids are in school and follow a more disciplined lifestyle. When the kids are in school, I’ll have more time to do all those things I could do to lose weight again and tone and strengthen my body. But for me, promising to start later is an invitation to lapse into bad habits. It could turn into a “ It’s like a last hurrah, the last meal before death row, the last party as single and/or childless woman” kind of time in my life. I would make these last three weeks a time to eat mindlessly and lounge around. For me, it’s time wasted and I never feel any better when I give up control of living healthy. *Running to clear by mind, not for distance or pace. My mind and body were clear and revitalized after running with my son today. I just enjoyed his company and the beauty of one of the many new running places I have in my new hometown. *I am making protein a priority in all of my meals. I am still dealing with low iron levels and I can tell when I don’t eat properly as my body and mind don’t function as well as they can. *I’m slowly getting back to cooking meals from scratch and this time I’m including my children. It’s important for me to model good habits and cooking is an easy one to share with them. I think they’re going to be better cooks than me! *Making simple adjustments to eating habits like limiting restaurant meals and dropping a tablespoon of creamer from my coffee is actually easy to do. I don’t feel deprived when I do this. It’s just as easy to fall back into good routines as it is into bad ones. *Writing when it strikes me and letting things go like laundry and unpacking the last remaining boxes. Now I don’t mean I plan to neglect things like feeding my children or picking my husband after work, but some things can wait, especially when I don’t have a set writing time right now. Getting ready for another work out session! 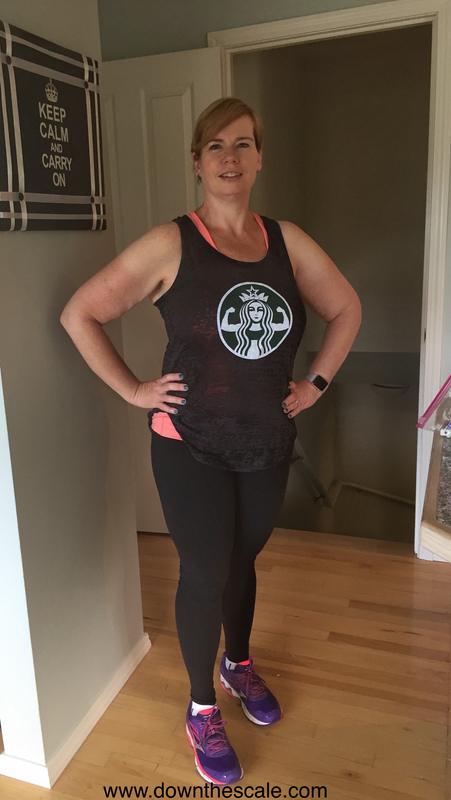 I never thought I would wear a tank top to exercise in, but here I am almost four years after gastric sleeve surgery wearing one! Living a healthy lifestyle is the best change I made! What is it about exercising in groups that makes me so self-conscious? It’s not so much a problem in classes like spin where everyone is on their own bike so it doesn’t matter if you’re slow or uncoordinated. Unless you fall off the bike or perhaps sing too loud to the music, no one cares or notices what you’re doing. You’re not keeping anyone from advancing or slowing down the group when you’re in spin class. Other exercise classes are a different story. Or at least that was my preconceived notion before I did a boot camp class today. Most of my fears and concerns were gone by the end of class. First, I managed to do all the stations without passing out. I did however text a friend before class to remind her that she was in charge of picking out a good photo for my obituary should I die from either exertion or embarrassment. Fortunately I did neither and I was once again reminded that exercising is about me, not anyone else. Today’s class was my first group weight training class in about ten years. When my children were little, the YMCA was a godsend with its childcare so I tried out classes even though I was obese. I was proud of myself for participating, albeit slowly and clumsily, until one fateful day. A perky girl, who I could only think thought she was being helpful by cheerfully rushing up to me after class said, “Wow, good for you! You’re doing this class.” My dumbfounded and angry face must have given her the impression she should just back away slowly. As if I didn’t say to myself every class, “It’s OK you’re the only fat mom in here, just keep trying. No one cares.” From that day on, every time I took that class I thought that people must feel sad for the fat chick in the class. It was devastating, but I did keep going. Here I am almost four years out from my gastric sleeve surgery and I must admit I’m still self-conscious about my body. Oh, I’m in the best shape of my adult life and I exercise regularly including running, but the “fat chick” in my head likes to make herself known from time to time. My personal training sessions have boosted my confidence tremendously, but they will be ending soon. I realized it was time to try out a group class to keep working on strength training. I’m very lucky that my personal trainer also teaches the boot camp I did today. I was reassured that she would make sure my form was good when she could. When I walked into class I realized that it was made of women of all shapes, sizes, and athletic ability. No, I wasn’t the skinniest woman in the room, but I fit in just fine. But you know what? It didn’t matter what I looked like or what I could do because no one cares! Now, I don’t mean that in a malicious way as in people are uncaring, what I mean is that everyone is there to do their best. It’s not a fashion show or a competition. This boot camp was all about people doing their personal best. Was I awkward, uncoordinated, and insecure? You betcha! I was also determined, strong, and proud. Sure, my lunges were slow, but I rocked it on the TRX bands. As I moved from station to station, I became more comfortable and relaxed. In no time, the session was over and I did everything. I assume everyone else did, but I didn’t notice. This time was about me and what I could do. And thankfully no one came up to me commenting about my abilities, weight or the fact I was even in the class. But if someone had said something to me, I would have been irritated, but I would have brushed it off. I am proud of what I can do and I am not focusing on my weaknesses when I exercise. I’m working hard to be this way in all aspects of my life. I’m taking one giant step, or rather lunge, forward to being positive mentally and physically!